Darren Till will face Tyron Woodley for the welterweight title at UFC 228, despite missing weight for his last bout, and it looks like Robert Whittaker isn’t a fan of that decision. Till came in several pounds over weight for his bout with Stephen Thompson in May, and following his decision win over the contender, he’s been booked for a title shot on September 8th. Whittaker faced Yoel Romero in June, who was tapped for a bout with the middleweight champ, despite the fact he missed weight for his February bout with Luke Rockhold. 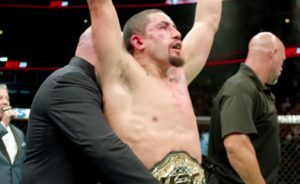 Whittaker is expected to face Kelvin Gastelum sometime in early 2019. The middleweights are coaching opposite one another on the 28th Season of The Ultimate Fighter.